Another December cyclone from the Bay. Though not rare, it surely is the fag end of the North-East Monsoon season, for the South. 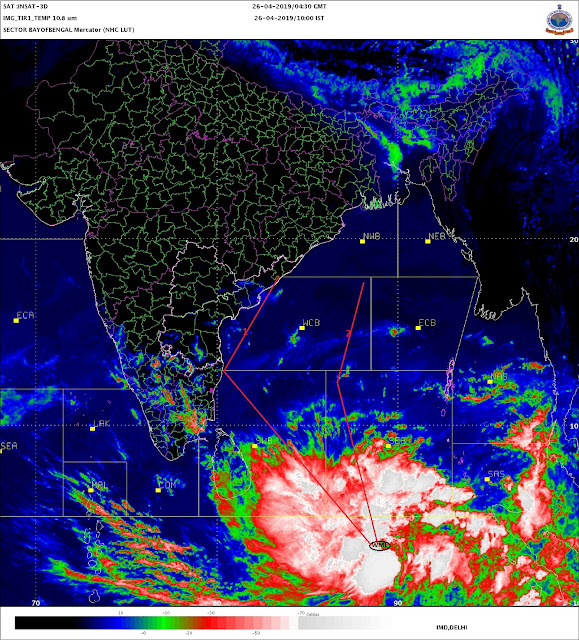 Thursdays depression over south-west Bay of Bengal has intensified into a cyclone, "Ward"., according to IMD. However, with a core pressure at 996 mb, JTWC still puts the prospects of a cyclone development at "good". The upper level winds are conducive for further development with low vertical wind shear, and enhanced outflow, allowing the system to grow. Satellite imagery shows sustained and deepening convection and organise around a consolidating low level circulation centre, though covered and obscured by high clouds. The upper level environment is conducive for further development, though vertical wind shear is low. Meanwhile, the western disturbance, mentioned in the previous blog, would affect western Himalayan region during the next 24 hours. Now, this approaching W.D. could, in all probibilities, prevent the cyclone from crossing the coast of Eastern India. In fact the W.D., though feeble, might just make the system skirt the coast, maybe upto the A.P. coast, and then coild move north-eastwards. But we can still expect very heavy rains along the T.N. coast and coastal A.P.